Like Chipotle, only way better. 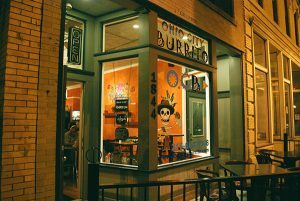 Ohio City Burrito, (or O.C.B.) is another Cleveland pastime. It’s always a safe bet when ordering food for large groups, like work parties or family get-togethers. The quaint little burrito joint sits in the heart of the Ohio City area with neighbors like Mitchell’s Ice Cream and Tabletop Board Game Café. While there are other Mexican-style restaurants in the area, Ohio City Burrito stands apart due to its fast-casual style facility versus your typical sit-down, authentic restaurant. O.C.B. 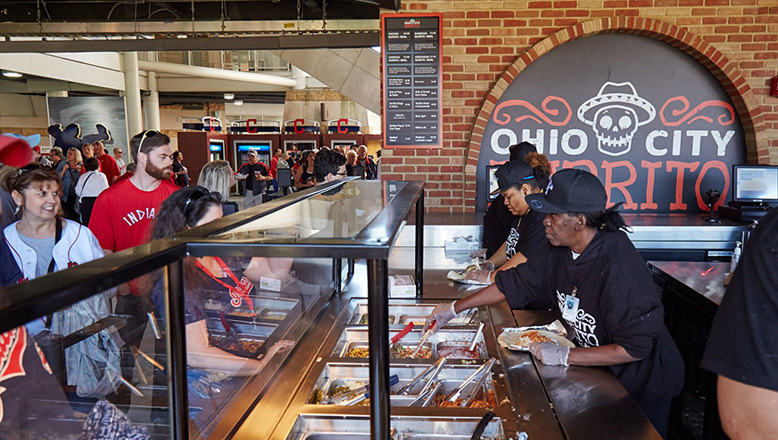 has 3 locations – the original on the famous W 25th Street in Ohio City, of course, one at Progressive Field which opened in 2016 and the newest location that will be making its debut in the coming months in the heart of downtown. People love it so much thanks to its great menu, affordable prices and unique interior. The menu offers all of the favorites including delicious burritos, tacos, nachos and more! Predictably, the burritos tend to be the most popular items. 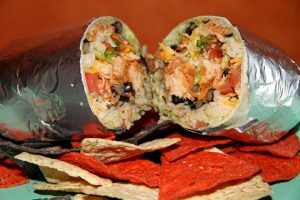 They are offer three different kinds: The “Brother’s Burrito” (Flour tortilla filled with rice, choice of beans & meat, guacamole, sour cream, cheese, lettuce & choice of salsa), “Veggie Burrito (the same as Brother’s, just no meat) and the “Naked Burrito” (in a bowl, no tortilla!). All are customizable so that you can create your perfect burrito masterpiece. The taco selection is simple but splendid. The “Talia’a Taco” (Choice of soft flour, soft corn or crispy corn shell, filled with meat, cheese, lettuce & choice of salsa for $2.50 // Tilapia for $3.10) and the “25th Street Taco” (Double layer taco w/ refried beans, soft & crispy shell…your choice of meat and all the fixings for $3.45 are the highlights. No Mexican meal is complete without some sort of chips or nachos. Well, Ohio City Burrito hasn’t flaked off there – they offer “Nachos” (Tri-color corn chips topped with melted cheese, choice of beans, salsa, guacamole & sour cream for $6.75 and you can add meat for $2.00), they also have “Chips and Guacamole” (Tri-color tortilla chips with their home-made guacamole for $3.95 and the classic “Chips and Salsa” (Tri-color tortilla chips with your choice of any of their home-made salsas for $2.95). The interior of the shop is covered in skeletons draped in festive Mexican gear. Everything from the walls to the tables offers tribute to this theme and affirm the authenticity even further. Both the inside and the outside of the shop is small, but if you’re lucky enough to grab a spot it’s a great spot for an outdoor lunch or dinner. 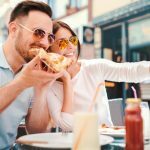 It’s definitely a great place to grab food with a couple friends and in the perfect location to stroll about the Ohio City neighborhood afterward. Be sure to stop in the Ohio City location at 1844 W 25th St, Cleveland, OH 44113. Hours are Monday through Saturday, 11 am – 8 pm. You can connect with the restaurant via phone at (216) 664-0908, or visit their website here.